AirTracks are Coming to Cheer Fest 2015! Revolution Cheer Co. is incredibly excited to announce that with the help of AAI and Airtrack Factory US we will have an AirTrack at Cheer Fest for everyone to tumble on and enjoy! Expect some awesome tumbling at this year’s event! 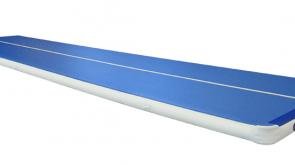 “AirTracks and CrossTracks from the AirTrack Factory are made according to the latest techniques, rely on good workmanship and are made of the best materials (supreme quality Double Wall Fabrics).